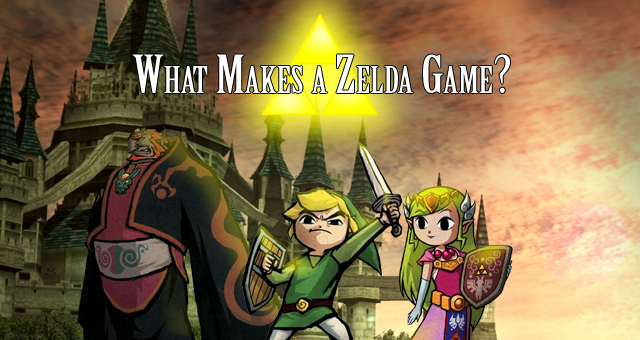 What Makes a Zelda Game? Over the past two years Nathan and myself have written somewhat of an impromptu six-part article series. What series is that you ask? Well, everybody’s favorite ‘The Legend of Zelda doesn’t need this and that’ series. Okay, so it’s not everyone’s favorite. Quite the opposite really. It has contained our most controversial pieces to date that stirred up mixed, and passionate, emotions. Many readers hated them and wondered how such content could come from a Zelda fan site. Some readers did enjoy them for what they were, which is great. But what were they exactly? They ranged from structured arguments, to humorous, to plain fanboy-having a cry style. To the delight of many, I can announce that the series is over – unless of course you want us to start going in to petty little things like bombs, and the bow and arrow. After so much writing about how Zelda doesn’t need its core aspects, with many valid arguments woven throughout, there is one question that has yet to be answered: what actually does make a Zelda game then? So if notable points can be made about the removal of each of these elements, despite what tone they were presented in, we must now ask what truly does make a Zelda game? Is it defined by games of inconsistencies and a timeline that doesn’t work? Is it the legacy of rolling – the main character must somersault around? Why these are elements that Zelda is known for, I don’t see them as defining the series. What does then? Well, let’s look at the Triforce, Ganondorf, The Master Sword and Hyrule. Is it a combination of a certain amount of these that makes a Zelda game? I don’t think so. They have appeared in roughly about half of the games each – some less and some more. They are an essential part of the Hylian and Zelda mythology, however they have proven themselves not to be necessary on a game-to-game basis. Elements such as these, in my opinion, are what make the series itself, not individual games. People think Zelda, they think Triforce and Master Sword, they think Zelda series. But the lack of these items in games like Majora’s Mask or Phantom Hourglass shows that a game can be a true Zelda experience without them. If these elements vanished forever, then it’s fair to say that we’d be left with a series that just isn’t The Legend of Zelda, it’s just that we don’t need them in every installment. Now, out of the six core Zelda elements, the protagonist Link is the only one to have made an appearance in all 16 titles. I think it is fairly safe for me to say that the one thing necessary for a game to be a true Zelda game is Link. He has to be the hero. As for Zelda, she is also a very fundamental aspect. She’s the titular character, and could be argued to have been in every game. That is if you think that Marin in Link’s Awakening can be deemed to be Zelda, like some people do. Other than that, there is a Zelda in every title – be it that she was Tetra in some of them and only a flashback in Majora’s Mask. Zelda is very fundamental to the series, no doubt, but it is not her presence that defines it. Finally, this is what I believe defines a Zelda game. Recently I wrote an article entitled ‘What is “The Legend of Zelda”?’, which explained what the true legend of Zelda is. What the myth or the story behind the whole series is. It is the sleeping Zelda backstory of The Adventure of Link which explains why every Princess is named Zelda. To me it also explains what makes a Legend of Zelda game. It is not about what appears in each game, no, it is about how each game relates back to the Zelda mythology. How each game can be connected back to the land of Hyrule, with its Princess, and its villain wanting the Triforce, with the Master sword that can stop him. They are all part of the real ‘legend of Zelda’. In my opinion, any game where we play as Link that can connect to this legend is a Zelda game. Majora’s Mask relates itself to departing from Hyrule and Link’s relationship with Zelda. Phantom Hourglass is where Link and Zelda are sidetracked from there journey to find the new Hyrule. You see, whether or not each aspect of Zelda makes a physical appearance in every game, it is there in spirit. It is related back to through the established backstory, and that is what makes a game Zelda to me. It’s no wonder that many fans have a hard time deciding on whether Freshly-Picked Tingle’s Rosy Rupeeland, Tingle’s Balloon Fight and Link’s Crossbow Training are true series installments. It is because they take place in universe and relate back to these core elements, even though Link isn’t the hero in Tingle’s spin-offs. Zelda games don’t need the title prefix ‘The Legend of Zelda’ (ie: Zelda II: The Adventure of Link) to make them. All they need is Link himself and links (connections) back to what we know as the true legends that make The Legend of Zelda. Legends of Hyrule, of Ganondorf, of the Triforce, of the Master Sword, and most importantly of all – of Princess Zelda. Physical game-by-game appearances are not necessary.